Nadja Revnik: How many dancers are you in your dance group Spicy Kittens? /comment Sometimes you can even see 7 or 8 dancers on stage. Nadja Revnik: And how long do you stick together as a group? Diddy Hyun: We have been dancing as a group for over 2 years now. Nadja Revnik: Wow, that's long! Nadja Revnik: Who is doing the choreography? Diddy Hyun: We all do some each. Usually we do 6 songs. We choose our own song and choreograph it. And we chore 2 songs - each the females in the group I mean. The men are mostly our puppets. Nadja Revnik: Hehe. I know you and Ray are a couple. Are the other two dance partners a couple as well? Diddy Hyun: Yes, Gem and Ger are a couple and so are Bubble and Jam. Rayzza Rubble: Don't give her ideas, Nadja. Nadja Revnik: Heh, well, I just tried to find out what makes the guys act like puppets. Diddy Hyun: They love the attention. Lol. Hehhehhe. All the female spectators. Nadja Revnik: Ah! Heh. many fans? Some throwing underwear? Diddy Hyun: Yeah, lol, you got it! Nadja Revnik: And about the animations. Do you create them yourself or do you do the choreo from available dances? Diddy Hyun: We buy all the annimations from various shops around SL. Nadja Revnik: Ah, ok, and then you arrange those in a HUD? Diddy Hyun: Yes, we all use the huddles delux model. Nadja Revnik: And how did you get the idea to found a dance company? Diddy Hyun: I had the idea a long time ago, cause I enjoyed it so much. 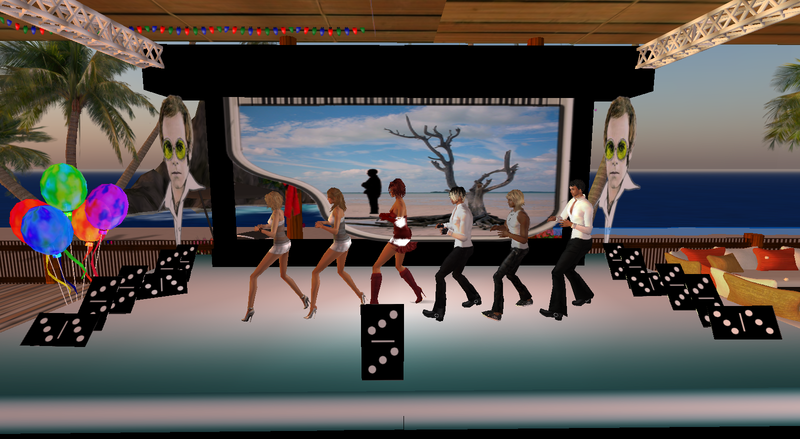 Dancing in SL and making the dances to various different tunes. There are quite a few dance troups in SL and some of the work is very cool. Home of the Spicy Kitten is a bar called Alleycats. 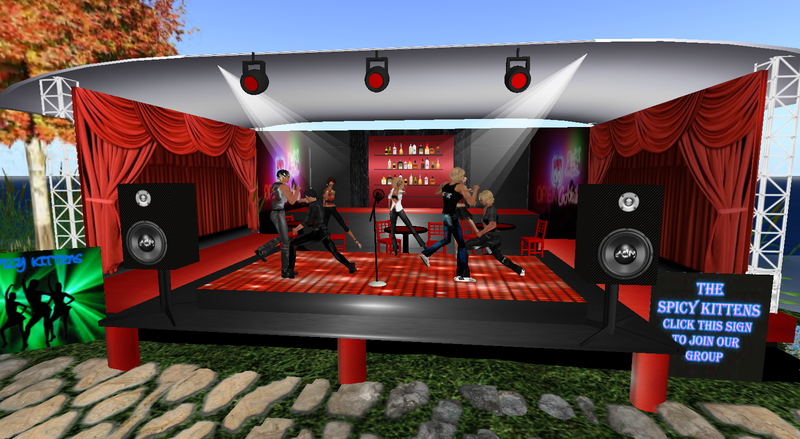 The Spicy Kitten and Tigers are a dance troupe in SL. The Kittens started off as an all female group and now we have 3 great men with them. 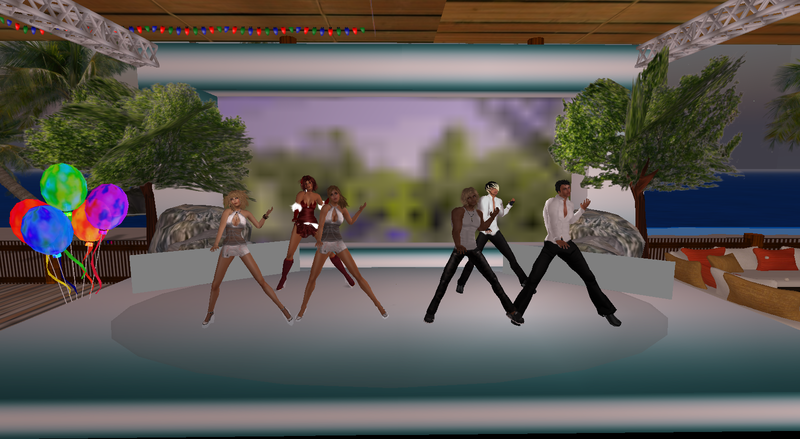 Their groups consists of Diddy Hyun (Dids), Bubble Roffo (Bubs), Diamondgem Destiny (Gem), Tone Larnia (Tone), Jam Xurina (Jam), Gerry Greenberg (Ger) and Rayzza Rubble (Ray). Jam DJ's for the group. LIFE HAS MOVED ON AND THE FOUR COUPLES HAVE BECOME CLOSE.